The Sunday before last, it finally rained in Houston! To celebrate (and entertain the kids) we took Jackson and Audrey bowling for the first time! It was a hit. I didn't get very many photos because the lights were off so folks could watch the football game, which Ross appreciated but also meant I couldn't get very good pictures. Instead of focusing on taking pics, we just enjoyed playing the game. 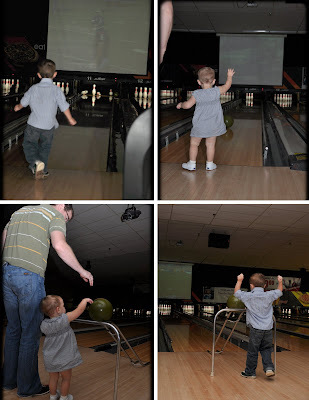 The ramp was in use by another family when we first got there, so we taught both kiddos how to bowl "granny-style". Later they got to push the ball down the ramp, which was tons of fun too!